I did a more general "Ocean" theme with my Storytime-To-Go program last week, but focused on "Sharks" for my regular storytime. I'm not particularly obsessed with sharks, but I do have a lot of fun with the Shark Week theme each year! There are several fun stories, and this year I found a great pop-up book and some awesome props to borrow from colleagues, so I was really excited to do this storytime. We started with our welcome song, and the kids guessed right away what the theme was because they saw the tail of the shark puppet sticking out of my bag. I let them all pretend to be scared of the puppet for a minute, then showed them some really cool fossilized sharks' teeth that a co-worker and her family had found on the beach while on vacation last summer. I used a non-fiction Scholastic book, Sharks Face to Face, to show them a few different kinds of sharks (great white, tiger, leopard, hammerhead, goblin, sawnose, and whale sharks) and a picture of someone holding a Great White Shark tooth to give them a sense of how big they are. 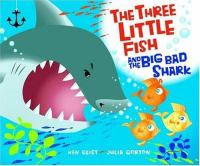 Then we sang our story song and read our first book, The Three Little Fish and the Big, Bad Shark by Ken Geist and Julia Gorton. This fun story is a re-telling of The Three Little Pigs, and I like this version even better! Not only is it a fun story to read, but it's great for storytime because it is so repetitive, so the kids can join in and say the "Little fish, little fish, let me come in!" and "the "Not by the skin of my finny, fin, fin" and the "Then I'll crunch and I'll munch and I'll smash your house in!" Next we sang a song featuring the food chain, where each creature gets eaten by a bigger sea creature, "Slippery Fish", which I used in last year's "Shark!!" storytime as well, and with this year's ocean theme. The kids all seem to catch on to this one quickly and seem to really enjoy singing along. I chose something on the shorter side for our second book, but very interactive, Shark In The Dark by Nick Sharratt. In this sequel to Shark In The Park, Timothy Pope is once again looking around with his telescope, but this time it is bedtime and he is looking out his window to the sea (how lucky is he to live that close to the ocean!). As in the previous book, he keeps seeing what he thinks is a shark's dorsal fin, but turns out to be something else, like a sail, tip of a bird's wing, or the top of a giant plastic ice cream cone. The kids will have fun predicting whether it really is a shark each time, and if not, what it could be. Then we sang "The Creatures In The Sea" to the tune of "The Wheels On The Bus", starting with sharks. Chomp, chomp, chomp; Chomp, chomp, chomp. 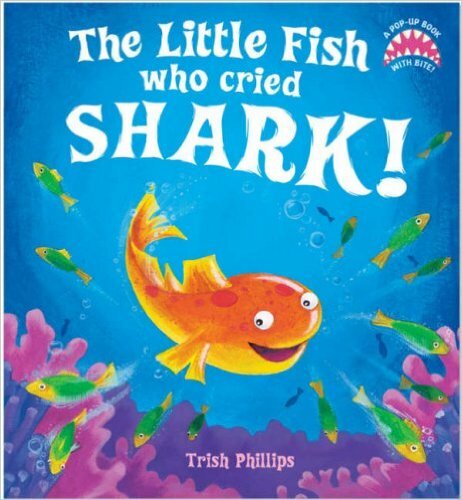 I saved the best for last with my new favorite shark book (but The Three Little Fish is a very close second), The Little Fish Who Cried Shark by Trish Phillips. Not only is it a really cute story and another shark-y re-telling of a folk tale, it is a pop-up book! Unfortunately it is out of print, but I took a chance and ordered a used copy on Amazon, and was very pleasantly surprised. There is a bit of wear on the pop-ups, but they are in surprisingly good shape and all work. Little Sprat loves scaring all the other sea creatures by yelling "Shark! ", so when he hears the warning he ignores it, thinking someone is just getting him back. But then, a large dorsal fin appears from behind the coral, and a giant shark pops out! Then we sang our closing song, passed out shark stickers, and let everyone have a turn with the shark puppet. We all had so much fun today! To start with, I was greeted with lots of cries of "Miss Jennifer!!" and lots of very enthusiastic hugs, like they hadn't seen me in forever! I was a couple of minutes late, so maybe that was an eternity to them and built up their anticipation or made them worry I wasn't coming. Whatever the reason, I certainly didn't mind being treated like a rock star ;) That's the best part of the job! The kids loved this theme and had a lot of fun pretending to be scared of all the sharks. They were fascinated with the sharks' teeth, and loved being bitten by the shark puppet. At the end, they all wanted a turn with the puppet, biting me or their friends, with lots of squealing and cries of "Bite me, bite me!" Unfortunately there were a few tears when one child got a little too carried away and made the shark bite another's face. While the teeth aren't hard, they are stiff and slightly scratchy on tender 4 year-old skin. But once he got his turn with the puppet, the tears were gone. 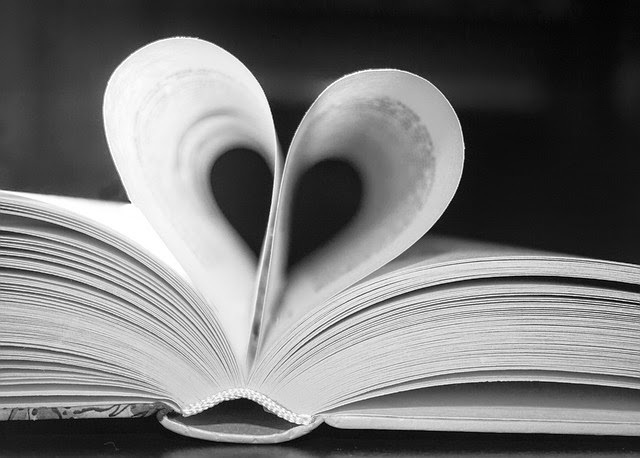 They really enjoyed all three books and both songs; for once it's really impossible to say which one they liked best. 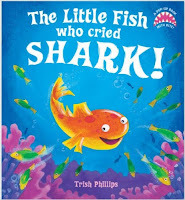 The Three Little Fish had a great story with lots of drama and repetition so they could say it along with me, Shark In The Dark was a fun guessing game, and The Little Fish Who Cried Wolf was a good story, but most of all, had great pop-up illustrations. They all did a pretty good job of listening and were pretty much engaged the whole time. **For more shark books, check out "10 Picture Books About Sharks" and "10 More Picture Books About Sharks".